Balsamic Glazed Chicken with Garden Tomatoes – Cheesy herbed chicken, on top of sweet roasted tomatoes, and drizzled with balsamic glaze. Most importantly, all you need are a handful of healthy ingredients and just 30 minutes to make. Such an easy, low carb dinner! Balsamic Glazed Chicken with sweet roasted garden tomatoes. Since we are in tomato season I felt that we needed a recipe to put all those tomatoes to good use – I used gorgeous heirloom tomatoes in this recipe from my moms garden and they were absolutely delicious – especially roasted. To make this recipe all you need are a handful of healthy ingredients, 30 minutes, and you have a delicious meal-in-one! First, roast the tomatoes at high heat with olive oil, garlic, and seasoning for 10 minutes until they are well roasted. Next, stir in tomato paste with roasted tomatoes to help thicken. Season chicken on both sides with salt, peppers, & herbs. 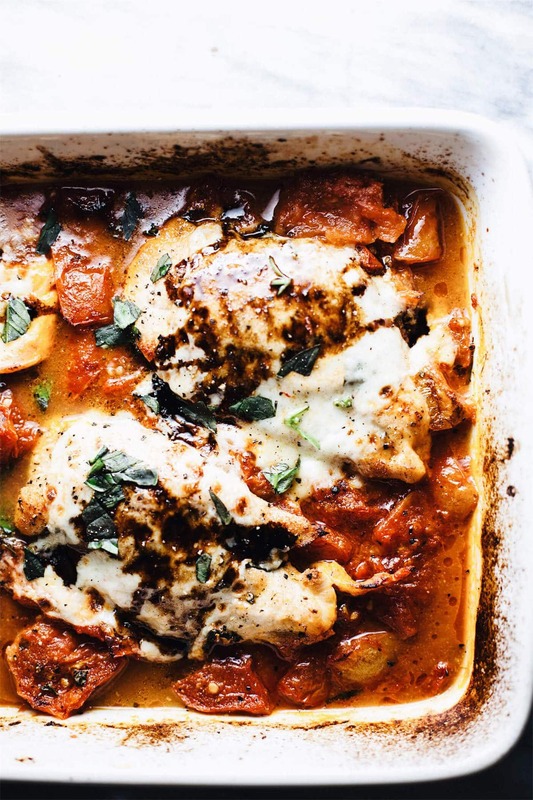 Lay chicken over tomatoes and bake for 15-18 minutes until chicken is cooked through. 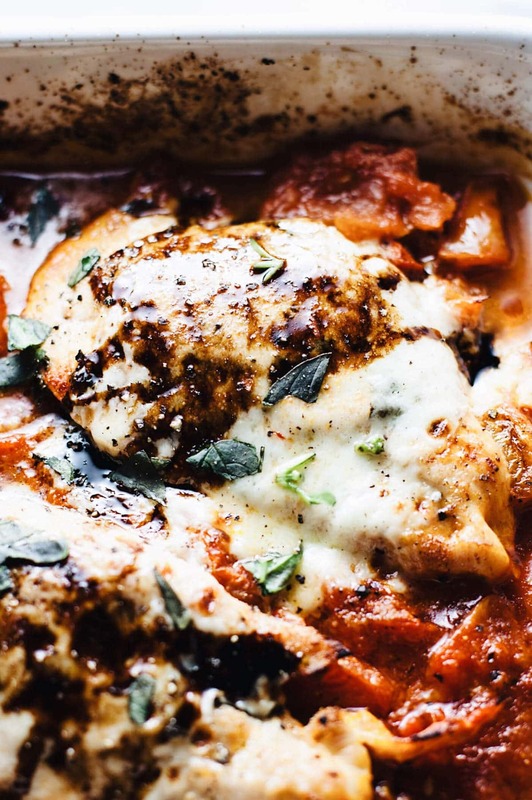 Finally, add mozzarella slices on top of chicken – broil on HI for about 1-2 minute until cheese is melted/bubbling. Drizzle with balsamic glaze and fresh chopped basil. You can use a variety of different tomatoes for this dish – roma, cherry, or heirloom tomatoes all work successfully for this recipe. I made this recipe with chicken breasts for a leaner protein – you can also use boneless/skinless chicken thighs. Balsamic vinegar or balsamic glaze – I recommend glaze because it is more potent/flavorful and less acidic than straight balsamic vinegar. For this balsamic glazed chicken recipe, I first roasted the tomatoes before adding the chicken so they could roast separately and evenly. I also love broiling this recipe at the very end to get the tomatoes and cheese browned and slightly charred. Can I Marinate Chicken In Balsamic Vinegar? To get more flavor from this recipe, marinate chicken in a glass bowl or ziplock bag with 1 tbsp olive oil, 1/4 cup balsamic vinegar, and pinch of salt & pepper. Marinate for 1 hour or overnight if needed. You can serve this balsamic glazed chicken with white or brown rice, roasted vegetables, any type of pasta (spaghetti, rigatoni, tagliatelle, penne, ect. ), zucchini pasta, Italian bread, or vegetable salad. Balsamic Glazed Chicken - A healthy 30 minute dinner that is so easy and absolutely delicious! 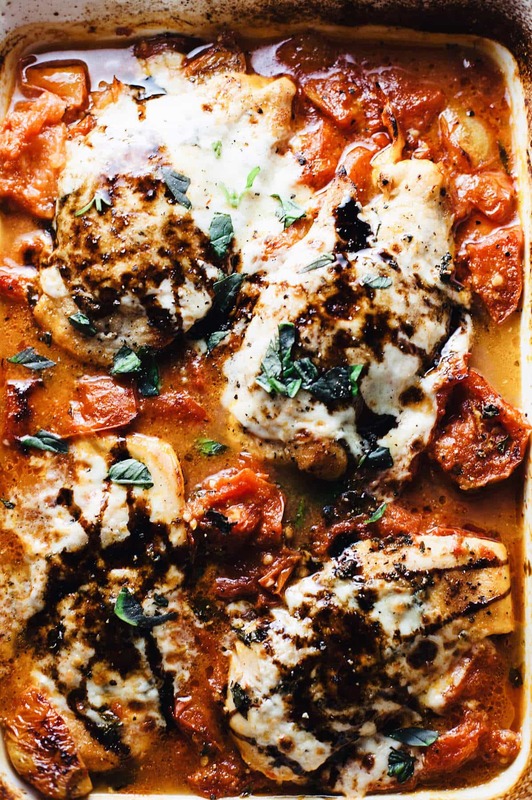 Tender herb chicken with balsamic and refreshing roasted tomatoes. Preheat oven to 425F. Lay tomatoes in a rectangle baking dish - toss with olive oil, minced garlic clove, and salt & pepper. Bake for 10 minutes until tomatoes are soft. Stir in tomato paste to cooked tomatoes to help thicken. 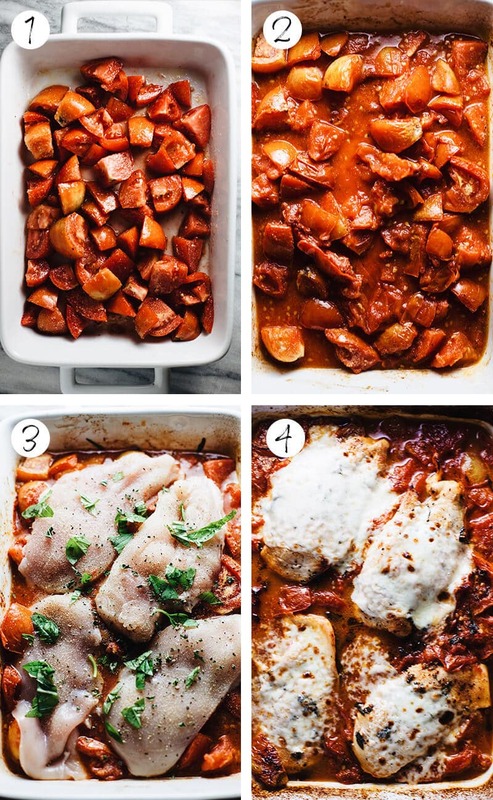 Season chicken on both sides with salt, pepper, and herbs (basil, thyme, oregano) then lay chicken on top of cooked tomatoes. 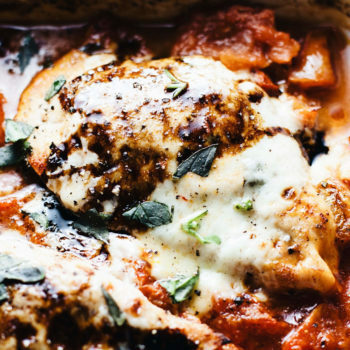 Bake for 15-17 minutes until chicken breasts are completely cooked through. Remove from oven. Put oven broil on HI - then lay mozzarella on top of chicken and place back in oven for 1-2 minutes while oven broils cheese. Remove from oven and drizzle with balsamic glaze and top with fresh basil. You can use a variety of different tomatoes for this dish - roma, cherry, or heirloom tomatoes all work successfully for this recipe. I made this recipe with chicken breasts for a leaner protein - you can also use boneless/skinless chicken thighs. Balsamic vinegar or balsamic glaze - I recommend glaze because it is more potent/flavorful and less acidic than straight balsamic vinegar. You can serve this balsamic glazed chicken with white or brown rice, roasted vegetables, any type of pasta (spaghetti, rigatoni, tagliatelle, penne), zucchini pasta, Italian bread, or vegetable salad.